An announced crowd of 22,197 braved near-freezing temperatures to catch the inaugural game at TD Ameritrade Park in Omaha, new home of the College World Series. The 24,505-seat stadium, which also serves as the home for the Creighton University Blue Jays, fared well despite the dreary skies. Designed to be easily (not sure exactly how) expanded to 35,000 seats, TD Ameritrade Park was built for a mere $131 million. Compare that to a $400-450 million MLB park in either San Jose (36,000 seats) or Oakland (39,000), and there’s a $300 million discrepancy. TD Ameritrade Park looks like it could be a major league park at least on the surface. What, then, is the difference between this so-called “hybrid” park and a true major league stadium? Let’s take a look. First, let’s start with what it has in common with most modern MLB parks. Sounds like everything a team would want aside from the total capacity, right? Not quite. Scratch the surface and you’ll soon see where much of that extra money goes. To illustrate this, I’ll compare TDAP with last year’s ballpark gem, 39,504-seat Target Field. 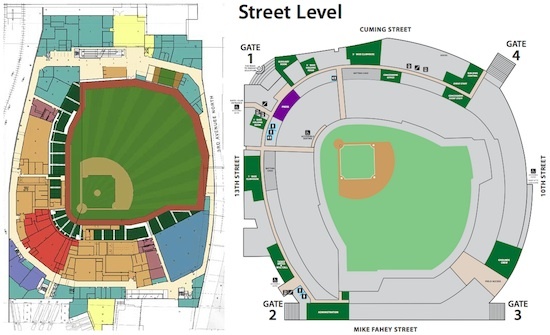 Event/Field level comparison between Target Field (left) and TD Ameritrade Park (right). Last year’s review of Target Field did not include a tour, so I didn’t get to see the bowels of the place. However, schematics of every level were made available two years ago, so I made sure to download them for future comparisons like this one. On the left you can see the different kinds of color coding and walls built throughout the sunken event level. The red-orange area behind the plate is the Diamond Club. The adjacent gold areas are the team clubhouses. With only eight acres to accommodate the Twins, virtually every possible space was used and optimized. On the right is the buildout for TDAP. While it’s not as detailed as the other drawing, it’s a clear indicator that not nearly as much space has been built out down below. Perhaps as little as 50% of the available space underwent a buildout. As a result the clubhouses are much smaller. There is no club lounge behind the plate. The commissary is smaller. And it all makes sense. There’s no need for all of the luxury amenities at a place that’s meant to serve college baseball first and foremost. Or at least you’d like to think so. Plenty of other differences pop up once you start looking around. Fewer levels – TDAP has three levels plus the press box on top. Target has six levels and is much taller, which translates to more than double the amount of concrete and construction work. The missing 8-15,000 seats – To properly add permanent seating, a third deck or significant expansion of the existing decks would be required. That means more concrete and structural steel, more $$$. Scoreboard/Video board – The video board is just slightly larger than the new auxiliary board installed at Target Field over the winter, and one-third the size of the main board. The scoreboard is a refreshingly retro line score job, no frills. Electronic signage – There is no ribbon board or other signage along the upper deck facing, which gives TDAP a very clean appearance. Fewer amenities – No multiple clubs or restaurants, team stores, or team offices. The one club lounge is small compared to most at MLB parks. Fewer suites – The 30 suites is fewer than what you’d see at a MLB facility. They’re also not quite as decked out as comparable suites. Simplified circulation – No escalators and few elevators. That knocks off a few million in capital and maintenance costs right there. There isn’t even a complex network of ramps and stairs. Little flex space – There’s no need to build additional space that could be used to rent out as Omaha has its arena (Qwest Center) and the adjacent convention center across the parking lot from the ballpark. All the stuff listed above adds cost, and in a manner closer to exponential than proportional. It’s unfortunate, but that’s the price to play in the majors. It’s possible to design a ballpark so that it’s less complex, which is what 360 has been doing. Value engineering also comes into play, though at varying degrees and at different times depending on the budget situation. Could the A’s build a ballpark on the cheap? Sure. That said, once you start ratcheting down you get into dangerous territory. Wolff has already received criticism for downsizing the Earthquakes stadium vision. The last thing he’d want to do is recreate the experience of ARCO Arena, which was built on the cheap. The cheapness would become evident quickly, and it may have done the Kings in as a result. As the definition of a “major league” venue has only grown in cost and complexity over time, so has the gap between good enough and great. For a level-by-level overview of TD Ameritrade Park, check out this interactive Flash graphic from the Omaha World-Herald. Cal Baseball is safe for at least the next 7-10 years, thanks to relentless fundraising efforts. Tonight marks the last NBA game to ever be played in Sacramento, at least for the foreseeable future. As part of the new federal budget pact reached over the weekend, Congress is looking at numerous transit projects as low-hanging fruit for cuts including California’s High Speed Rail project and BART-to-Silicon Valley. It’s not enough to kill those projects, but it could stretch out planning while the projects try again for scarce federal funding in the future. BART-to-SV faces a lawsuit from a Milpitas industrial park owner whose access may be severely affected by construction of the line next to the property. The property owner wants an injunction against any further work until the issue is addressed. Oakland Mayor Jean Quan is getting creative in figuring out ways to overcome the City’s $58 million budget deficit, which is $12 million more than when she came into office. In addition to a $80/year parcel tax, Quan is looking at short-term financing of the City’s retired police and firefighters’ pension plan. The Contra Costa Times’ Daniel Borenstein has a scathing critique of the pension refinancing plan and the City’s previous (largely failed) attempts to rein in the costs. The more you read about the plan, the more it looks like the Raiders’ Coliseum deal, full of overly optimistic projections and heavy on risk to the City. The current budget shortfall doesn’t have any material impact on any Oakland ballpark efforts, but decisions made now that could adversely impact fiscal feasibility down the road could have a huge impact. OnMilwaukee.com has the first in a series of articles remembering the efforts needed and political battles waged to build Miller Park. A study by the University of Toronto claims that the NHL is subsidizing numerous US-based teams and that Canada could support as many as 12 franchises (double the current number) thanks to high demand north of the border. I’d like to read this study before passing judgment. A bill to authorize a new stadium for the Minnesota Vikings has been introduced. However, it will not be heard until after April 26 and will have only a month to get through the legislature. Pundits are not giving the bill much of a chance of passing. 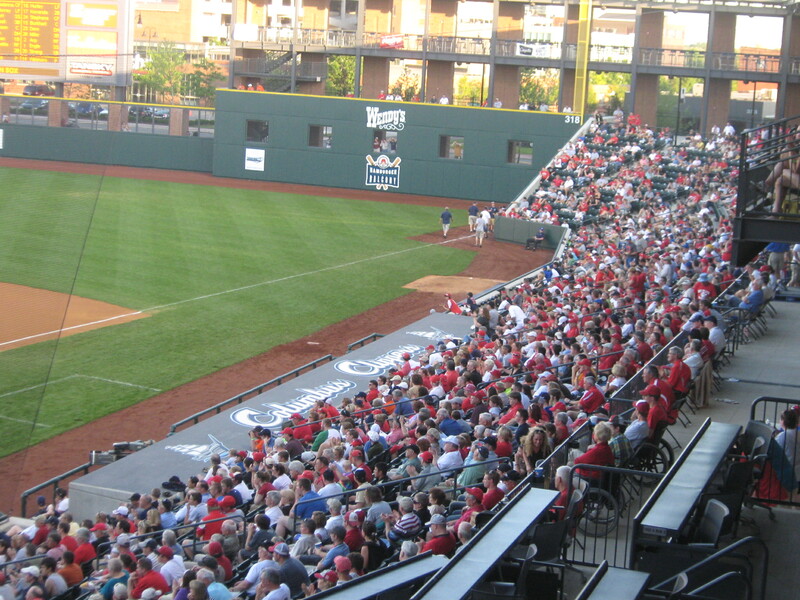 Two, count ’em, two ballparks are opening in Omaha over the next week. Werner Park, 9,000-capacity new suburban home of the Omaha Storm Chasers (AAA-Royals), seemed to be built in record time. TD Ameritrade Park in downtown Omaha, which is the new home of the College World Series, will host its first game next Tuesday when Creighton University hosts Nebraska (TV: CBS Sports Network/CBS College Sports). The 24,000-seat ballpark can expand to 35,000 for the CWS, though officials are quick to point out that even with the size, the ballpark is not a major league park. A word on the Giants-Dodgers-Bryan Stow situation. As much as it’s heartwarming to see the outpouring of support for Stow, who remains in a coma following his beating following an Opening Day game two weeks ago, it’s important to remember that wasn’t the first incident, and sadly it won’t be the last. Two months ago, 20-year-old San Carlos resident Taylor Buckley pleaded guilty to one count of involuntary manslaughter three years after the 2008 “sucker punch” killing of Anthony Giraudo outside a Giants game at AT&T Park. If anything, I’m surprised these incidents don’t happen more often. I look back at all of the A’s-Yankees games at the Coliseum, the Giants-Dodgers games at both AT&T and the ‘Stick, and I remember multiple fistfights and fans tumbling down the steps. More often than not, security gets there in time to stop the truly tragic from happening. Unfortunately, all it takes is for someone to hit his head on the edge of a concrete step, or for some thug to wait until he’s out in the parking lot to be an idiot, and then it’s a tragedy. It’s brutal and senseless, yet the line between a small no-harm skirmish and a tragedy can be so small. I want to believe in the better angels of our nature. Sometimes it’s not easy. Lastly, and on a bittersweet note, the baseball season in Japan is starting, three weeks late and a month after the earthquake, tsunami and Fukushima Daichi nuclear plant ordeal began. Not to be outdone, a rival to the dome/town at UNLV has emerged. The $1.5 Billion complex, called the Las Vegas Sports Center, would consist of three separate venues instead of one multipurpose domed stadium. Included would be a NBA/NHL-quality arena, a 50,000-seat football stadium for UNLV football, and a 9,000-seat partially covered baseball stadium for the AAA 51s. The area targeted for the project is near downtown, the same area which has been bandied about for a new arena and a new MLB domed stadium in the past. The ballpark could be expanded to MLB capacity, though with the way it would be constructed it’s hard to see how it would work. Architecturally, all three venues would have large arches from which tensile roofs would be partly suspended. Heading up the plan is a group called International Development Management, with 360 Architecture doing up the plans. The scary bit? It’s quite possible that the UNLV Now domed stadium concept could approach the cost of the three purpose-built venues simply due to the cost of the technology that would be used. VTA has an idea for finding operating funds for Caltrain’s 2011-12 year: take it out of the electrification and stalled Dumbarton Rail Corridor projects. The Dumbarton project would rebuild the abandoned rail bridge south of the existing vehicular bridge and provide rail between Union City and Redwood City. Interestingly, this redheaded stepchild of public transit (VTA took from it for BART-to-San Jose) may receive renewed interest now that Facebook has announced plans to move its 2,000-employees-and-rising from Palo Alto to the former “Sun Quentin” campus in Menlo Park. A planned station would be situated adjacent to some land that Facebook bought for parking or a campus expansion. Blowback from the Super Bowl seating scandal continues with one fan looking to sue the NFL and Jerry Jones. Also suing: Cowboys premium season ticket holders who got limited view seats. All this hubbub reminds me of a friend who lives in Chicago. A few years ago, he got Super Bowl tickets as his family had Bears season tickets for several generations. The weekend of the big game, a family friend died and they were forced to cancel the trip. Let’s calm down and have a little perspective, shall we? The Rangers announced that they are raising single game ticket prices. We can call that the Beltre-not-Lee Tax. Good ballpark articles this week, everyone. Baseballparks.com (Joe Mock) just named their Ballpark of the Year for 2010. And the winner is… BB&T Ballpark in Winston-Salem, NC. What/where/why? you ask? Read the review and the press release (PDF). And note that one of the firms involved was none other than 360 Architecture. BB&T Ballpark won out over Target Field and several other minor league parks. Mock tends to like the retro look, so you may feel different. In any case, both are worth a read. Update: In a previous thread, craiger [hat tip] mentioned that 2009 award winner (and 360 project) Huntington Park in Columbus, OH, has a RF colonnade reminiscent of what has been conceived for Diridon. Take a good look at this pic and ask yourself if you want the brick façade treatment on the exterior, the unadorned columns on the interior, or something in between? It should also be pointed out that the ballpark is a companion piece to another 360 project, Nationwide Arena. The Braves are good, but the crowds aren’t. Where’s John Rocker when you need him? SI writer and Minnesota boy Steve Rushin waxes much more poetically than me on Target Field. Eminem and Jay-Z are doing a sort of home-and-home, hip hop, ballpark concert series at Comerica Park (this coming weekend) and Yankee Stadium (the following weekend). B.o.B. opens. Escondido continues to figure out whether or not bringing the Padres AAA franchise in would be worth it. Speaking of the Pads – they want no part of a soccer match at Petco during a pennant race. I’m sure that Larry Baer won’t regret the Cal Bears playing at AT&T next year, especially if the Giants continue to bring in defensive liabilities to play the outfield. Rosenblatt Stadium says goodbye tomorrow. You’re welcome. I feel like Trey Kerby all of a sudden. Look whose field is going to be trampled by 300-lb. linemen soon? Tedford said the only negative about the bowl game was having both teams on the same side of the field. That won’t be the case in 2011, as teams will be on opposite sidelines. I never understood having the teams on the same sideline in the first place. Good to see that this is being addressed. As for playing football games on a pristine baseball field during the regular season: I hope the revenue is worth it.